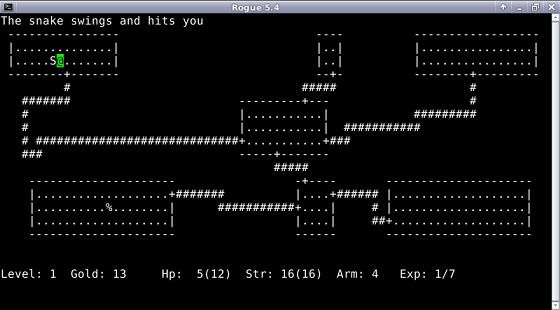 In Rogue, the player assumes the role of an adventurer. The game starts at the uppermost level of an unmapped dungeon with a myriad of monsters and treasures. The goal is to descend to the bottom level, retrieve the Amulet of Yendor, and then ascend to the surface. Until the Amulet is retrieved, the player cannot return to earlier levels. Monsters in the levels become progressively more difficult to defeat. To get started you really only need to know two commands. The command ? will give you a list of the available commands and the command / will identify the things you see on the screen. You are the @ character. Press space bar to advance through --More-- messages. The complete guide is included in the documentation.